Access Statement - our Access Statement as a .pdf (you'll need a PDF reader). Accommodation - a description of The Dairy (see also the Access Statement). Availability - check and pricing. Book now! - contact information. Information - detailed information about the facilities, some credits for photography, etc. Terms & Conditions of renting The Dairy as a .pdf (you'll need a PDF reader). Visitors' comments - read comments from the visitors' book. 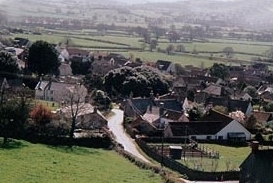 Westbury-sub-Mendip - some information about our Somerset village.